London is claimed to be the most haunted city in the world, and locations within the city are the focus of many historical paranormal, hauntings, and strange events. 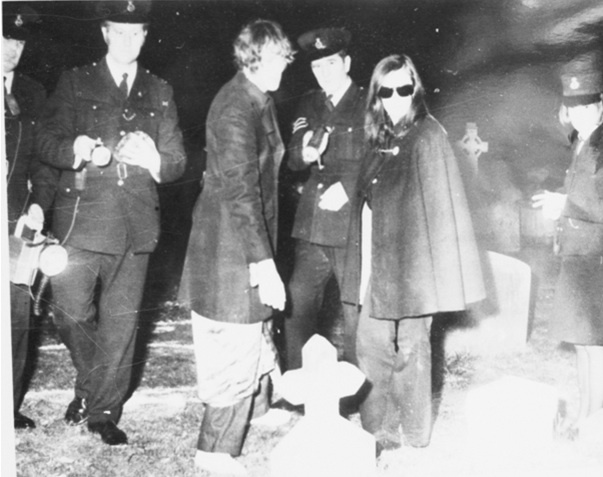 On 21 December 1969 David Farrant spent the night in the cemetery, and was the first to document strange experiences. He later claimed he had seen a grey ghost like figure. In a letter to the Hampstead and Highgate Express on 6 February 1970, he wrote that when passing the cemetery on 24 December 1969 he had again glimpsed “the grey figure” that he had said he saw the night he stayed in the cemetery and of which he considered to be supernatural. In his published letter he asked if others had seen anything similar. On the 13th, several people replied, describing a variety of ghosts said to haunt the cemetery or the adjoining Swains Lane. Swains Lane was previously the location of a large number of hauntings. These reports of ghosts were described as a tall man in a hat accompanied by a woman in white. others reported as seeing a pale white child like face glaring through the bars of the cemetery gate. Further reports claimed of bells ringing, and voices calling from the gravestones. A second local man, Seán Manchester, was as sure as Farrant in his belief belief that a supernatural entity was present in the cemetery. ‘a King Vampire of the Undead’, a medieval nobleman who had practised black magic in medieval Wallachia (Romania), had been brought to England in a coffin in the early eighteenth century, by followers who bought a house for him in the West End. Manchester also claimed that modern Satanists had roused the Vampire, and the right thing to do would be to stake the vampire’s body, and then behead and burn it. The Vampire publicity was enhanced by a growing rivalry between Farrant and Manchester, each claiming that he could and would expel or destroy the spectre. 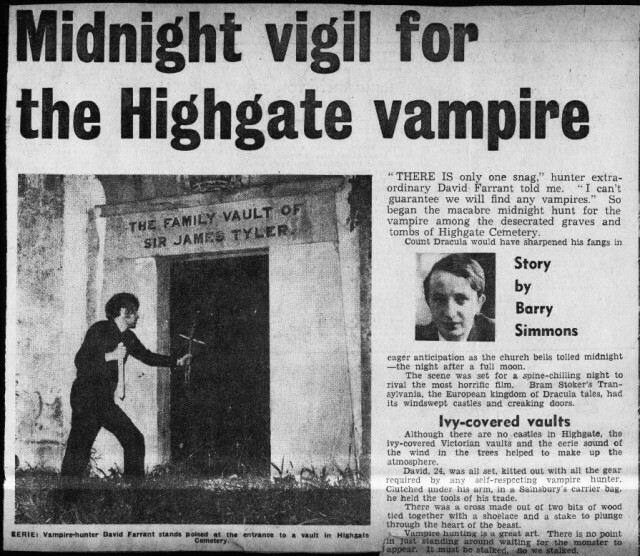 Manchester declared that he would hold an ‘official’ vampire hunt on Friday 13 March 1970. Media reports then appeared with others who claimed to have seen supernatural figures in the cemetery. On the evening of the 13th, a mob of ‘Vampire slayers and hunters’ from all over London and beyond swarmed over gates and walls into the locked cemetery, despite police efforts to control them. 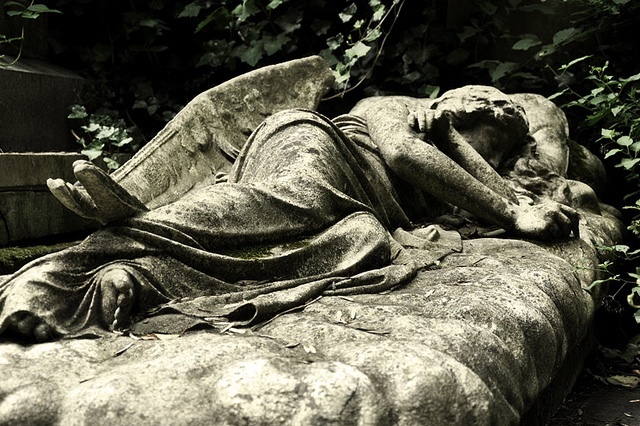 According to London, he and six companions entered the cemetery, unobserved by the police, via the damaged railings of an adjoining churchyard, and tried to open the door of one particular catacomb to which a psychic sleepwalking girl had previously led him. Unable to open the door of the catacomb, they climbed down on a rope through an existing hole in its roof. Inside they claimed to have found empty coffins, into which they put garlic, and sprinkling of holy. Events take a turn for the worse! Some months later, on 1 August 1970 (Lammas Day), 3 young girls visiting the cemetery found the charred and headless remains of a woman’s body not far from a broken catacomb. The police reports state they suspected that the woman had been used in black magic. The press reports state that this “offering” was the first step in raising the “king of vampires” and that a coven of witches had been responsible. There was more publicity about Farrant and Manchester when rumours spread that they would meet in a ‘magicians’ duel’ on Parliament Hill on Friday 13 April 1973, which never came off. 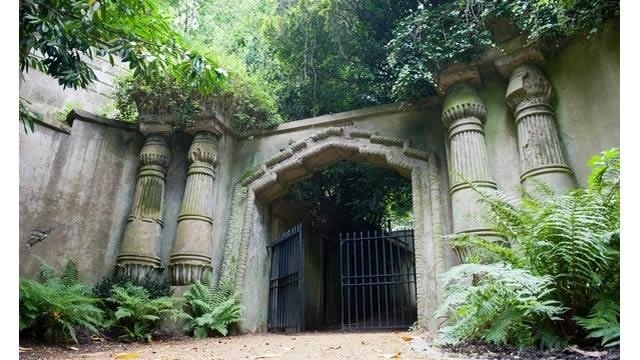 Farrant was jailed in 1974 for damaging memorials and interfering with dead remains in Highgate Cemetery—vandalism and desecration which he insisted had been caused by Satanists, not him.